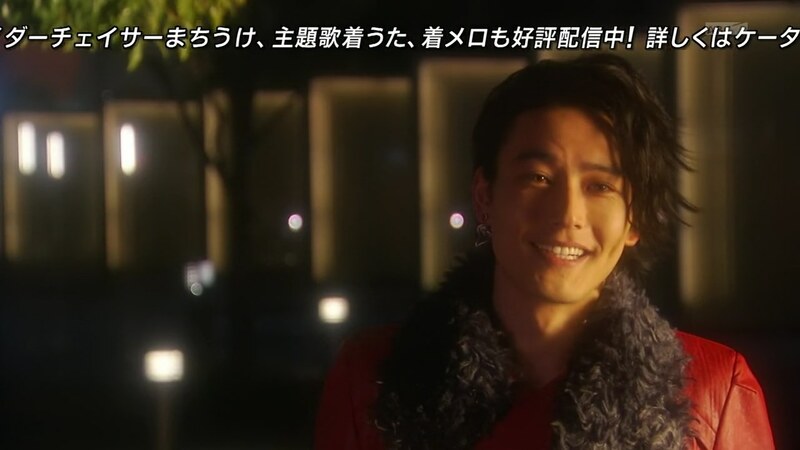 Recap: Kamen Rider Drive, Episodes 29 and 30 – What Really Happened During the Robbery? and Who Will Reveal the True Culprit? 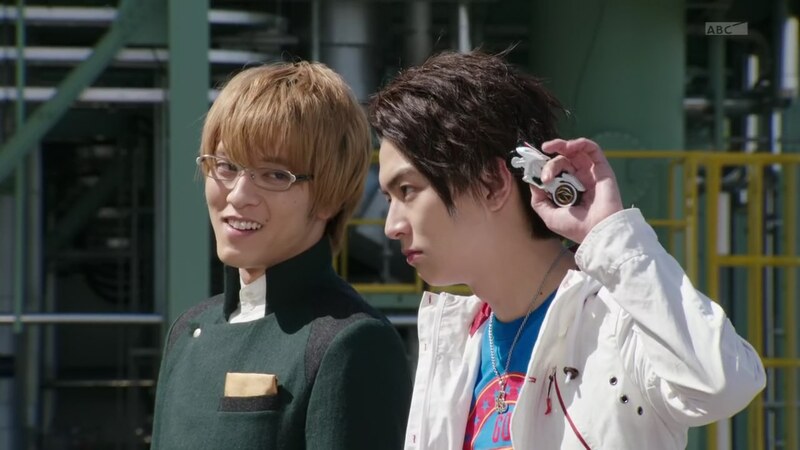 Gou henshins and Brain goes Roidmude. They fight. Brain suddenly takes his tablet out and flashes something on the screen to Gou’s face. Gou is surprised. Next day, the SID gang are talking about the serial robbery and murders that have hit the city in which three Eitou Bank branches were attacked with one person killed each time. But across town at a Futabadai Bank branch, another robbery is already in progress. The masked man demands a woman take him to the vault. 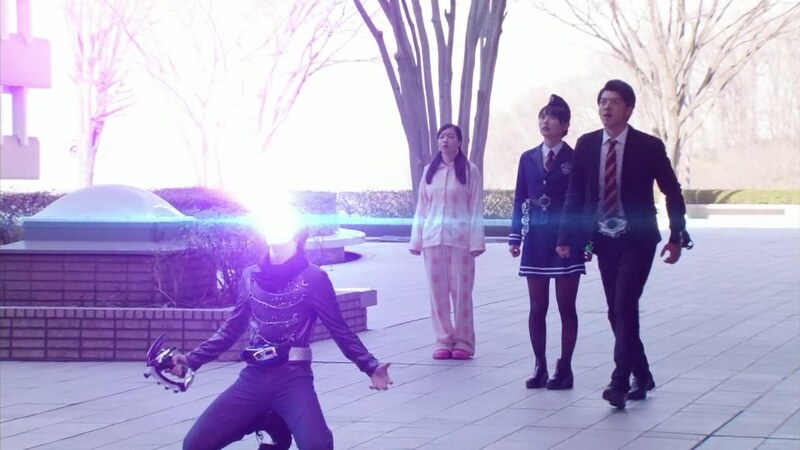 Several security guards manage to tackle the man, but he initiates a Gravity Shift and morphs into his Roidmude form. The SID are called to the scene. 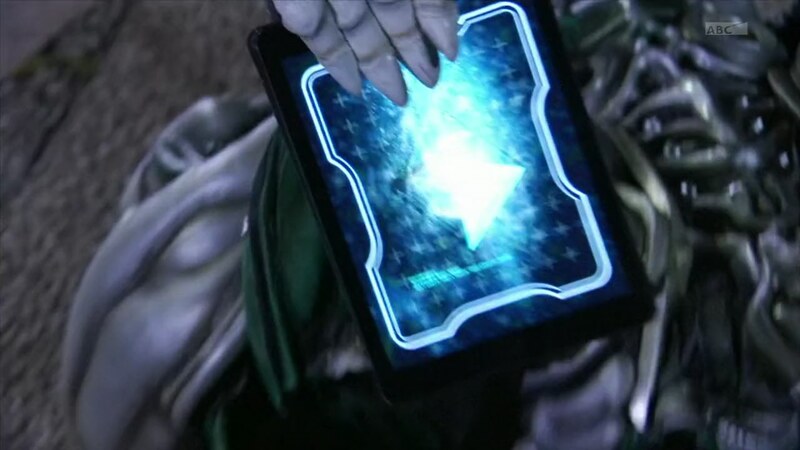 The robber/Roidmude 062 uses his own key to open the locked vault. He deactivates the Gravity Shift to allow the woman he pointed at earlier to fill his bag with the vault money. But as she stuffs the bag, 062 prepares to kill her. 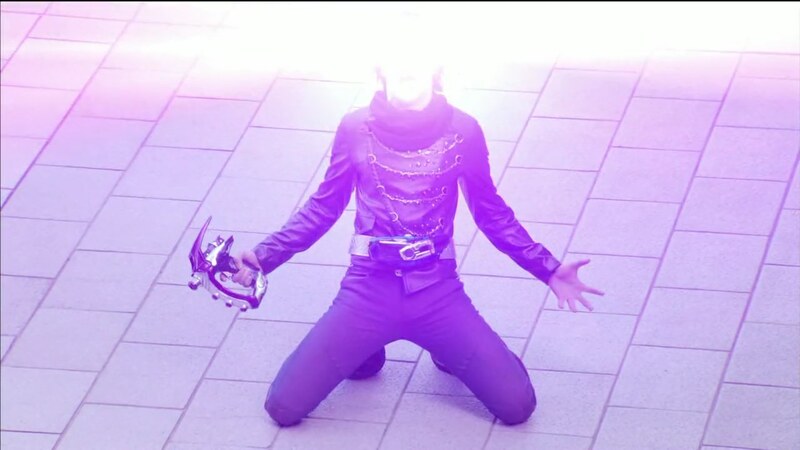 Shinnosuke and the Shift Cars arrive just in time and they see this is an Fusion Evolved Roidmude. 062 uses his magic universal key to break free of Justice Hunter’s cell and to attack Shinnosuke with file cabinets. Shinnosuke goes Technic and tries to use Door-ju, but 062 uses his key to leave Door-ju’s door open. Shinnosuke tells the people to run, but 062 takes their fight outside as well. 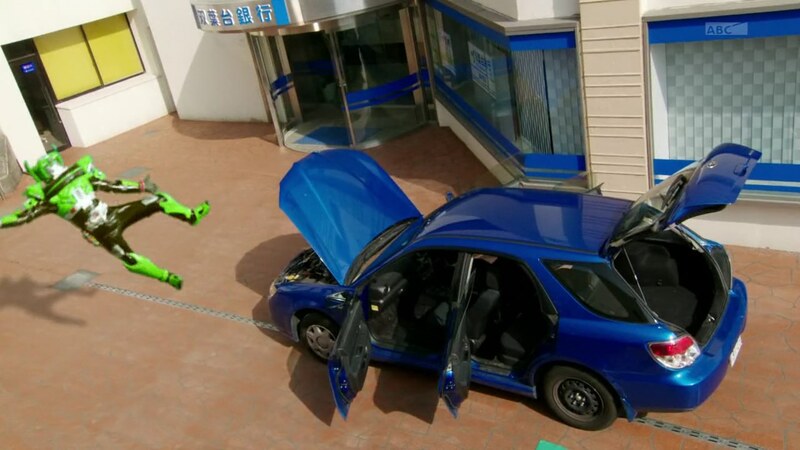 062 uses his key to open the doors of a car which send Shinnosuke flying up the stairs, right to where the people are trying to run off to. Shinnosuke goes Wild and their fight continues. A little girl’s balloon pops and the sound triggers a horrifying memory for one of the young ladies. She faints and is about to fall down the stairs, but Shinnosuke catches her. This allows 062 to escape. Over at the station, the SID is sitting in on First Division’s briefing on the case. They’ve found the masked robber is Negishi Itsurou. Negishi was arrested 12 years ago for robbery and murder and was just released a week ago. Shinnosuke seems to recognize who this is. Chief Nira orders his men to go forth and crime fight. They all leave, including Brain. Shinnosuke asks Nira what the SID will be doing. But Nira says they’re merely on Standby. But! 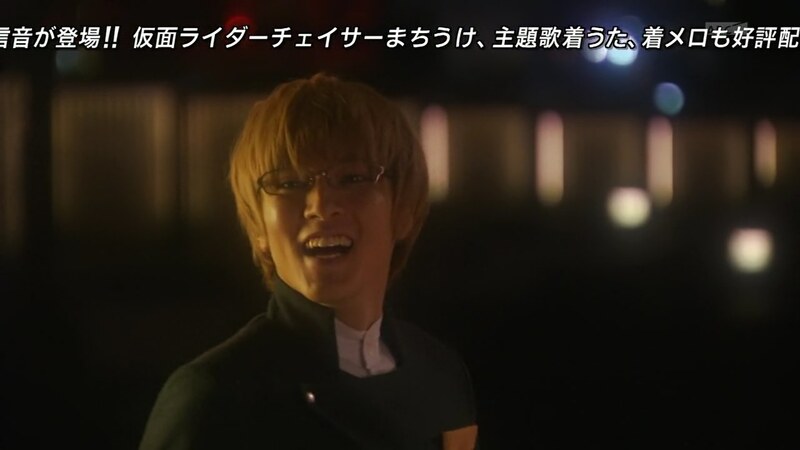 Negishi is the man who killed Shinnosuke’s father! Nira says he knows, but mocks Shinnosuke for letting his father’s murder go in the first place. In any case, Nira says he’ll let them know when they’ve caught Negishi and hopes Shinnosuke will be able to take care of the robot-half of the suspect, no problem. Shinnosuke insists on working the case. Chief Jun gets Shinnosuke to calm down and reminds Nira that his reputation is riding on this case as well. The SID will help any way they can. Nira appears to relent. But really, he just orders the SID to get them lunch and staple papers. While Shinnosuke is out at the bento place, Chief Jun explains what happened to the elder Tomari. 12 years ago, Negishi and one of his friends attempted a robbery at the South Kuruma Eitou Bank branch. 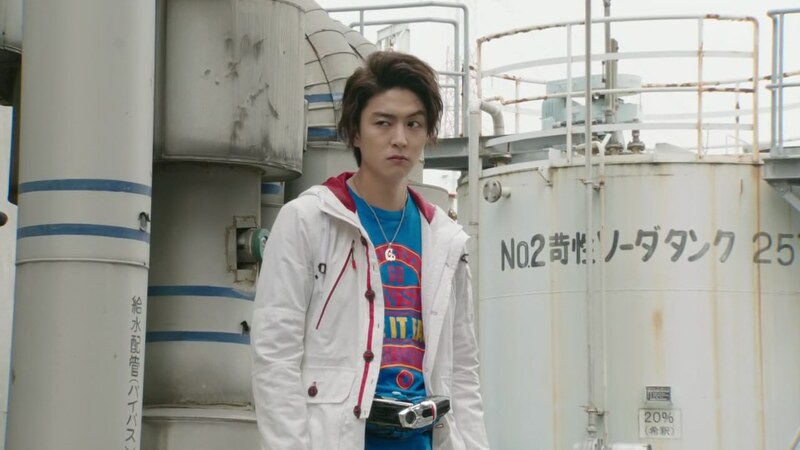 Tomari Eisuke just happened to be there as he had been waiting for an opportunity to catch these criminals. Suddenly, a little girl began crying and Negishi was about to shoot her to shut up. But Eisuke ran to the girl to protect her, he getting the bullet in the back instead. The police arrived soon after to arrest the men, but Tomari Eisuke was already dead. At least that’s what Chief Jun heard. He and Belt-san believe it all sounds suspicious and suspect 001 may be involved in manipulating this case as well. Shinnosuke is heading back to the station with the crates of bento when runs into Secretary Makage. Makage stops him, knowing he is the Kamen Rider. He tells Shinnosuke to keep up the good work. Later that evening, Heart catches up to Brain at a plaza and asks how it goes with 001. Brain says everything is going smoothly. Heart would like to hear about their work. Brain seems excited to tell him all about it, but he remembers the very harot Medic and tells Heart that as long as she is by his side, he will not return. Brain walks away. Heart wishes they could all get along, they’re all Roidmude, after all. Next day at the SID, Shinnosuke has found a clue. The three people Negishi has killed so far all worked at the Eitou Bank branch from 12 years ago. They also find that another teller from that branch now works at the Futabadai Bank which was hit yesterday. Shinnosuke concludes that Negishi is after all the bank employees from that day. Brain gives Negishi/062 the identity of the next target. This time, there’s no need for a robbery. 062 just needs to get rid of everyone from 12 years ago. Belt-san instructs the Shift Cars to go protect the people from the original incident. Kiriko thinks it’s weird that no one in First Division noticed such an important connection. But Belt-san says it must be 001’s doing. Shinnosuke feels he needs to do something, anything. He looks through the papers and sees Karasawa Yukari, the young lady who fainted yesterday, was also at the original incident. He and Kiriko visit her at the hospital, but she is not very willing to talk. 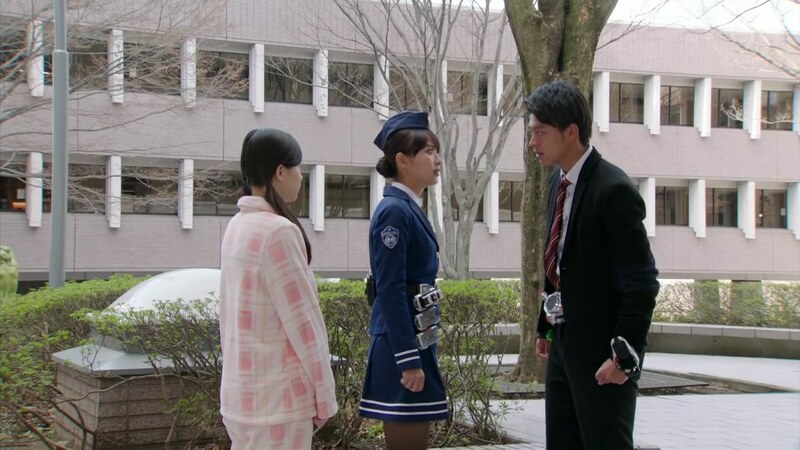 Otta catches Shinnosuke and Kiriko at the hospital to tell them they’ve tracked down Negishi’s accomplice from 12 years ago, Maruya. Maruya was released six years ago and has since reformed. Maruya tells Otta and partner that he doesn’t believe Negishi killed the policeman 12 years ago. He is not really sure how, but that’s what he believes. Even though 12 years ago, Maruya testified that Negishi did indeed shoot Inspector Tomari. Otta chases after Shinnosuke who runs off. 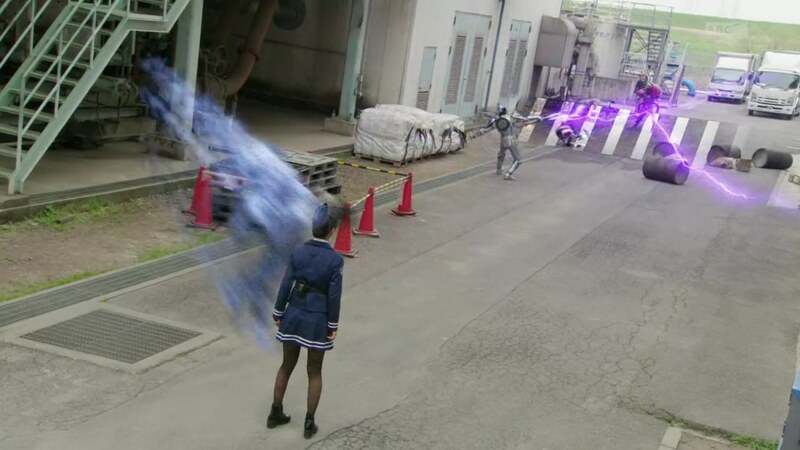 Kiriko, meanwhile, heads back to The Pit when Rinna calls her. Repairs to ProtoDrive Shift Car are done. And while the Shift Car functions are available, the memory data might not all be readable. Across town, Shinnosuke has found Maruya and demands he tell him what happened 12 years ago. Maruya says he cannot remember, no matter how hard he tries. 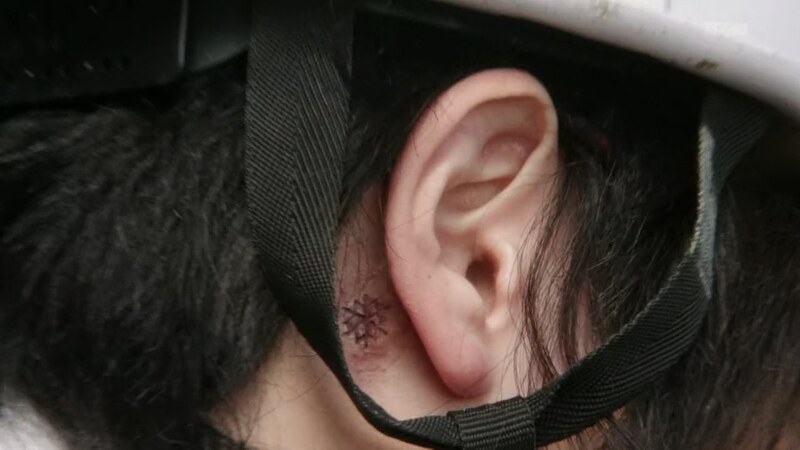 Shinnosuke then notices a strange mark behind Maruya’s ear. He thinks about it. He’s seen it before. It was also behind his father’s ear!!! While Shinnosuke is in Tridoron with Belt-san, Negishi walks toward Maruya and transforms into 062. That activates a Gravity Shift and Shinnosuke hurries over. Shinnosuke henshins and they fight. 062 again uses his magic key to try and get the upper hand. 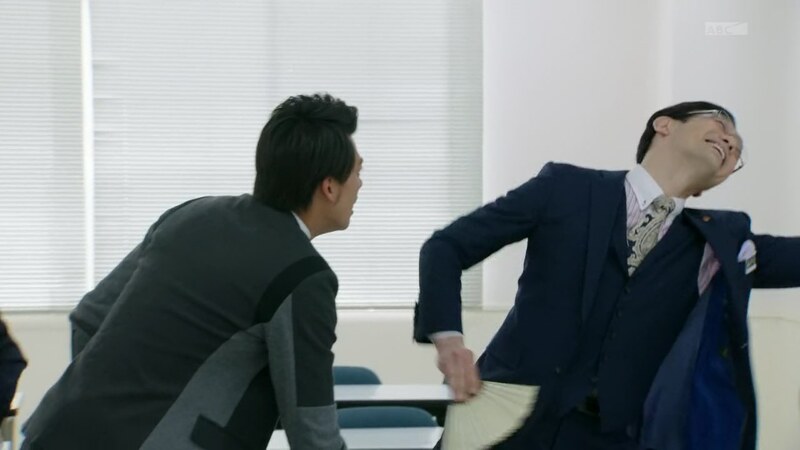 Chase arrives as Belt-san warns Shinnosuke to calm down so as not to be being erratic. But Shinnosuke can’t calm down. He needs to know what happened to his father. There goes that family talk again, Chase says. 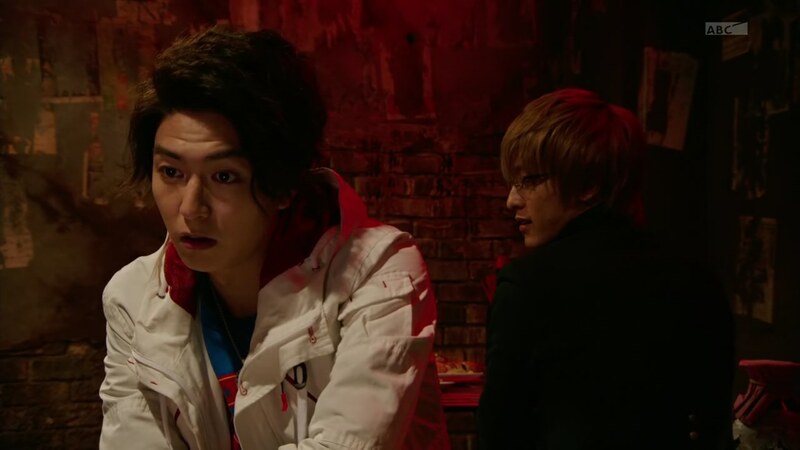 That’s when Brain appears… with Gou right beside him. Kiriko pops up as well. 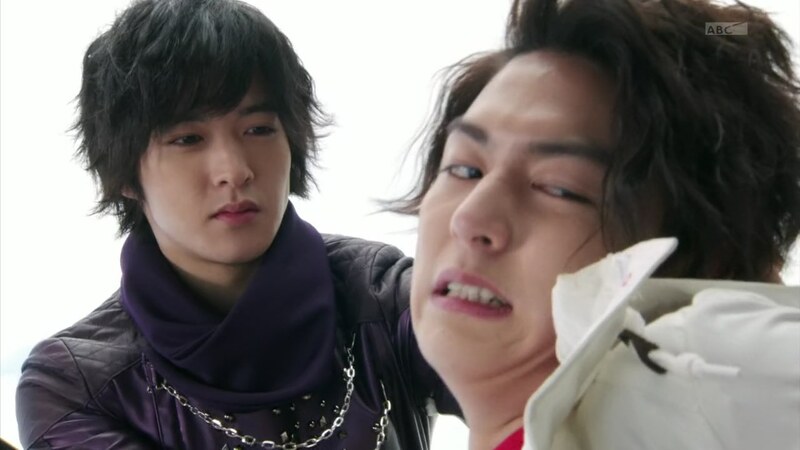 Gou henshins and attacks Shinnosuke. Chase henshins to help. Kiriko can’t believe what’s happening. She cries over to get her brother and future boyfriend to stop fighting. 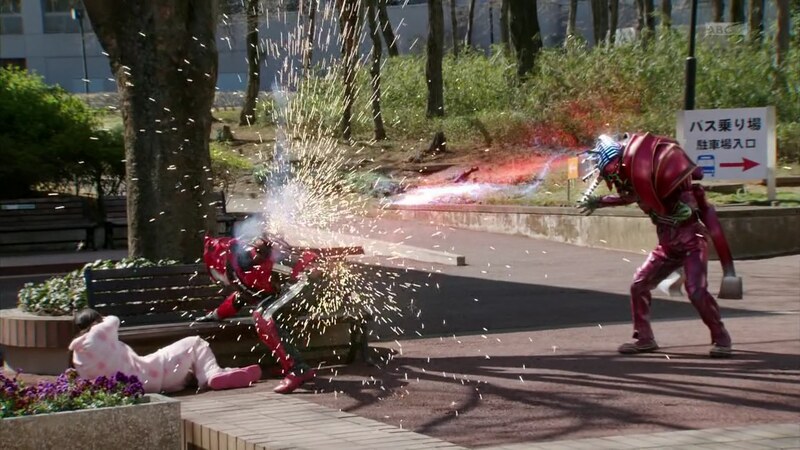 The distraction gives Gou an opening to shoot Chase and return to fighting Shinnosuke with 062. 062 uses his magical universal key a couple more times to toss Shinnosuke and Chase around. 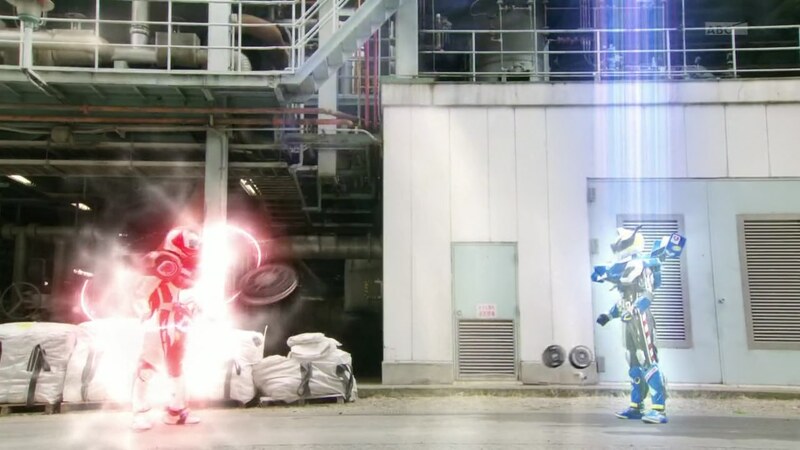 Shinnosuke goes Formula and Gou goes Dead Heat. Kiriko is beside herself. Brain thinks this is wonderful. Maruya screams as 062 is about to attack. But Chase bursts out of the barrels with the Signal Ax and reminds Shinnosuke that his responsibility as a Kamen Rider is to protect people. Shinnosuke and Chase manage to whisk Kiriko and Maruya away. Later that evening, Medic tells Heart about Brain drawing a Kamen Rider over to their side. She says she hopes Brain doesn’t regret what he’s done. Heart realizes what that is. Brain is with Negishi and gives him an updated list of locations of the people from The Incident. He leaves to take care of business. Brain compliments Gou on his attacks earlier and looks forward to the next time. 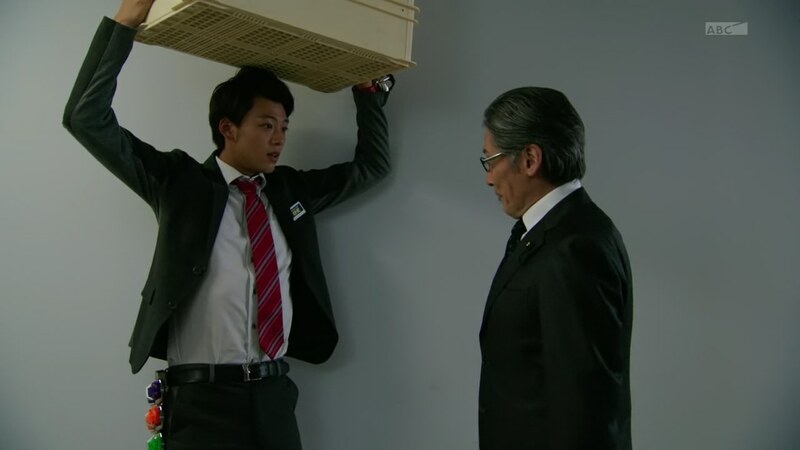 Next day, Shinnosuke is on the roof with Chase, explaining the situation with his father. Chase asks what is it about family that gets Shinnosuke, Kiriko and Gou all in a tizzy whenever they think about it. Shinnosuke explains that it’s because family is important to them, so when they’re in trouble, they just tend to panic. 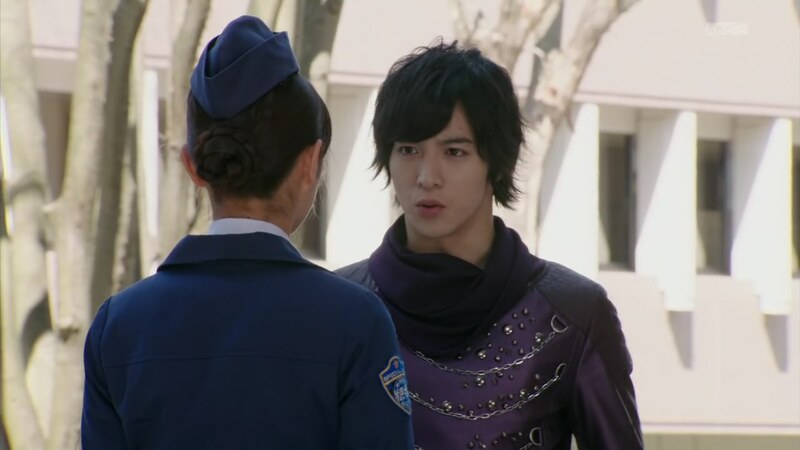 Kiriko unsuccessfully tries to contact Gou. Meanwhile, they all head to the SID to talk to Maruya who believes he felt the Heaviness during The Incident. He only remembered after feeling it once again yesterday. As suspected, Chief Jun says, the Roidmude must have been involved in The Incident as well. Chase recognizes the scar on Maruya’s neck and remembers hearing 001 has the ability to rewrite people’s memories using ice needles. It all comes together for everyone. Not only might Gou be suffering from the same memory wipe, but 001 is now trying to cover up The Incident because he was there! Shinnosuke doesn’t remember seeing a scar on Yukari’s neck which means she might remember 001. Shinnosuke and Kiriko hurry back to the hospital. Meanwhile, Gou has found Chase. Just as Chase expected. He wants to check behind Gou’s ear, but Gou only wants to kill him today. They both henshin. At the hospital, Kiriko aggressively tries to get Yukari to talk, but she is too afraid. 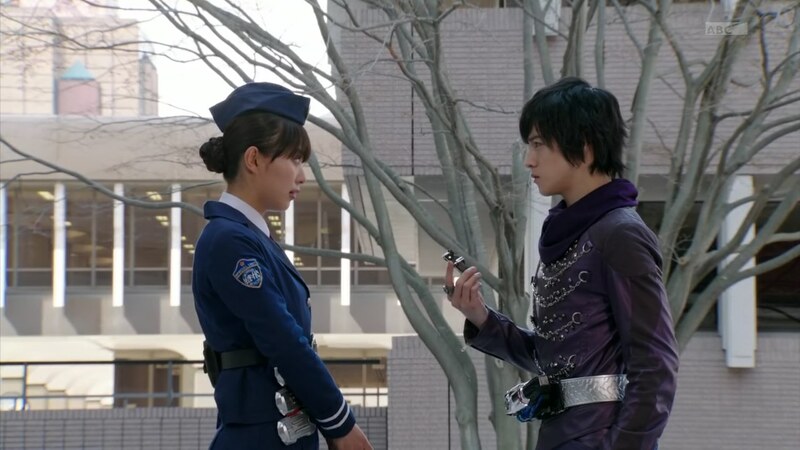 Shinnosuke tells Kiriko to stop. He remembered that as much as he wants answers, he must not harm others in doing so. As police officers, they should protect the people. Kiriko apologizes for being so rough. Gou and Chase continue their battle until they both unleash Full Throttle Finishers at each other. 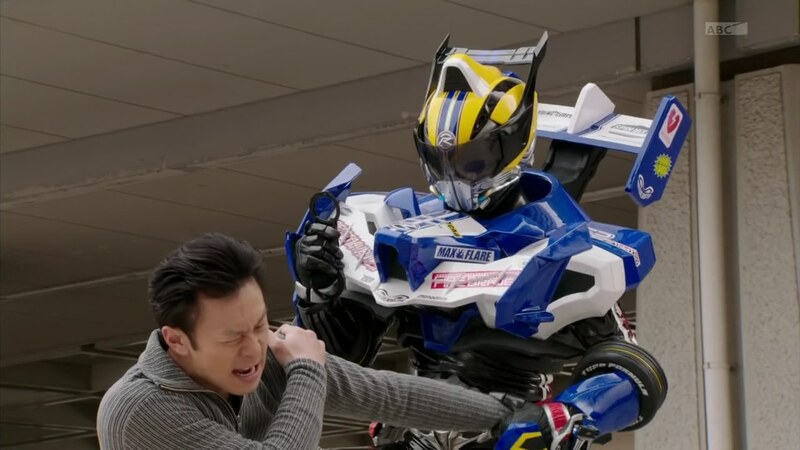 Chase’s is just a little bit stronger, forcing Gou to dehenshin. Chase dehenshins as he walks over and finds that indeed, Gou also has an ice scar behind his ear. Chase walks away, but Gou calls after him. Back at the SID, Nira wants to know where they’re hiding Maruya. Chief Jun compliments him on his intelligence gathering capabilities. Nira demands they hand him over and Chief Jun calls Maruya in. Suddenly, a whole army of Maruyas walk in, much to Nira’s consternation. Chief Jun tells Nira to choose whichever one he likes. Off to the side, Rinna commends Colorful Commercial for another job well done. While Makage gives a press conference about the robbery/murder spree, Yukari’s mother approaches Shinnosuke and Kiriko in the cafeteria. Hearing Shinnosuke’s name is Tomari, Mom asks if he is the son of Officer Tomari Eisuke. She knew it. Tomari Eisuke protected her daughter during The Incident 12 years ago and now the son has protected her as well. Shinnosuke thinks his father must be guiding him now. He reminds Kiriko that their first priority should be protecting people. And no matter what, even while investigating 001, they should not lose their heads. Meanwhile, Negishi makes his way into Yukari’s hospital room. She screams and tries to run when Negishi shows her his mask. But he initiates a Gravity Shift to stop her. He morphs into 062 which sends a Gravity Shift through the entire hospital. Shinnosuke hurries to the room and henshins. He takes Yukari outside, but 062 chases after them. 062 manages to knock Shinnosuke aside and is about to kill Yukari for good. But Shinnosuke runs over to cover Yukari and take the shot instead. Yukari flashes back to The Incident and being protected the exact same way. Chase arrives to help, as does Kiriko who Shinnosuke tells to take Yukari to safety. Shinnosuke uses Midnight Shadow, Massive Monster and Max Flare to knock 062 around. But one turn of his magical key and Shinnosuke goes flying. Chase jumps in to help out. Belt-san tells Shinnosuke to go Formula. As Chase pulls Negishi out safely, Shinnosuke finishes off 062 for good. Otta arrives with backup to arrest Negishi. Shinnosuke asks why he killed more people. Negishi says he already killed a cop. So if his life is already over, why not unleash the darkness inside him anyway. Shinnosuke sees Negishi also has an ice scar and concludes someone else must have shot his father. 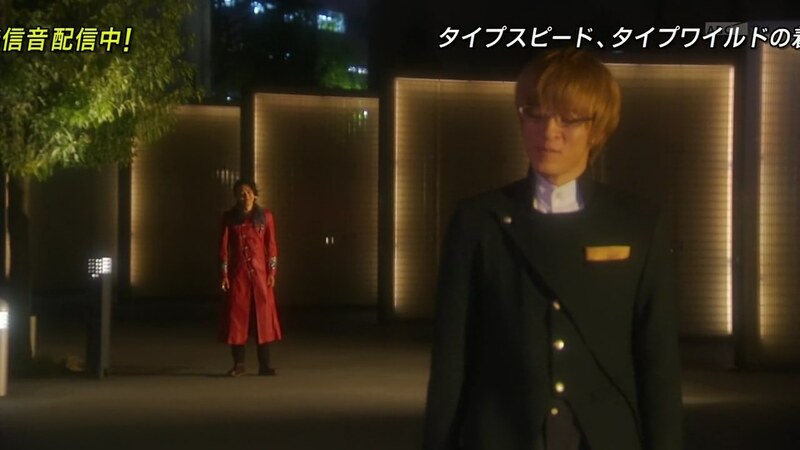 Chase approaches Kiriko. He first thinks of what Shinnosuke said about family. Instead of telling her the truth, Chase says he found no scar behind Gou’s ear. 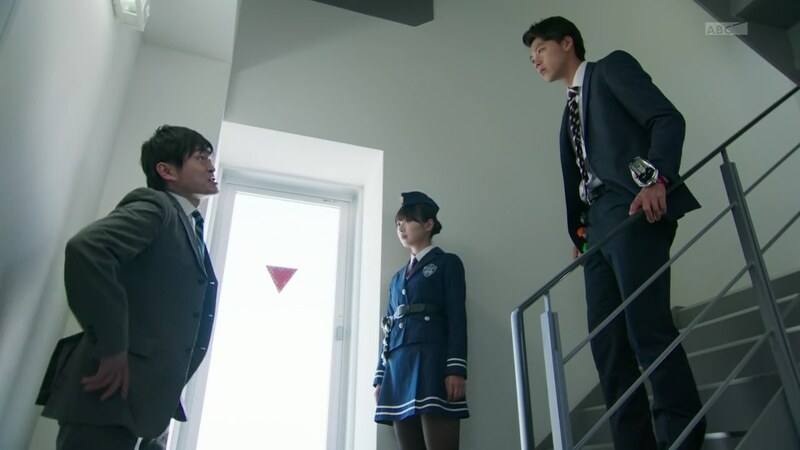 Kiriko reluctantly says Gou must have a reason for doing this then. She hands him the Proto Drive Shift Car, saying it is ready. He inserts it into his gun. Yukari thanks Shinnosuke for saving her life. But she is also now ready to talk about The Incident. She remembers seeing 001 at the bank that day. Suddenly. Chase screams. His memories are being projected out of his eyes! 001, Brain and Heart are looking over Chase. Brain asks Heart if they are really going to make this guy their comrade. Heart says Why not? He might be able to reach the Super Evolution state. 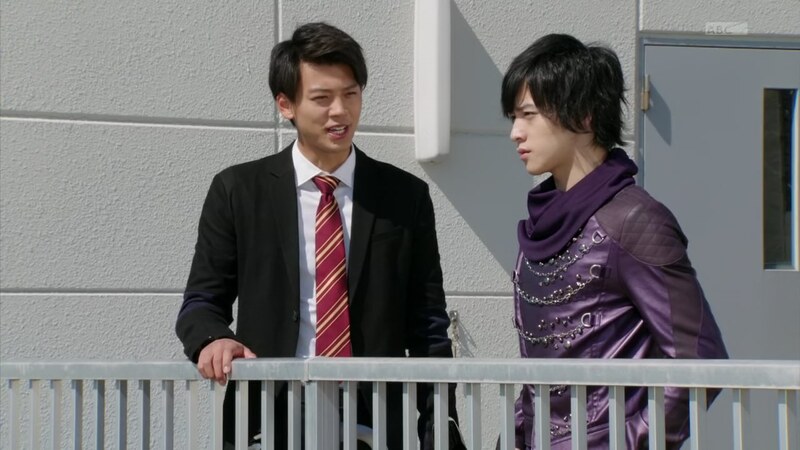 Shinnosuke and Kiriko watch the scene play out, including seeing all three Roidmude demorph into their human forms. 001… is Makage! Continuing my catch-up, I’m recapping these two episodes together. I definitely think these were much better episodes than what we’ve got recently. While the whole plot point with Shinnosuke’s father appeared without any good build-up, they did a solid job unraveling, at least part of, the mystery using Yukari. Father and son both saving the girl the same exact way may be typical, but it worked here. Especially since we haven’t really gotten big character development moments from Shinnosuke. The way 001’s identity was revealed to Shinnosuke and Kiriko was very convenient, but it was still surprising to have it happen so soon. I was expecting a few more episodes at least. It should be interesting to see what’s next there. And with Gou, after yanking him around with questionable, sometimes nonsensical, character and story development, they’ve found a way to absolutely halt any kind of development at all using the always convenient mind control. It’s still disappointing to see what was a great character with lots of potential merely be used as a plot device now. I guess that was his purpose all along? I hope they surprise me though. As for Chase harping on about family and such, it won’t be a surprise if he ends up being someone’s brother or father. Or even if the idols are related to Shinnosuke or Belt-san as actual humans. After all, who would’ve dreamed Kiriko and Gou’s father would come out of nowhere to be the creator of all Roidmude. 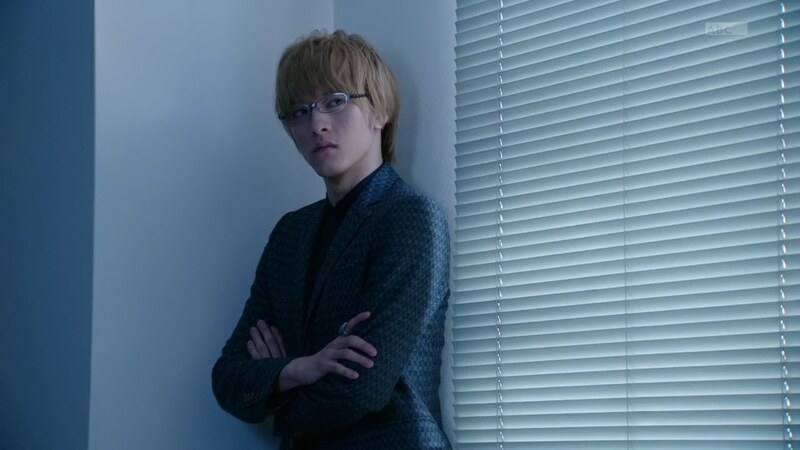 ← Recap: Kamen Rider Drive, Episode 28 – Why Were the Families Targeted?